Marina's Kitchen Table: Book Review - Hope Runs - SO good!! 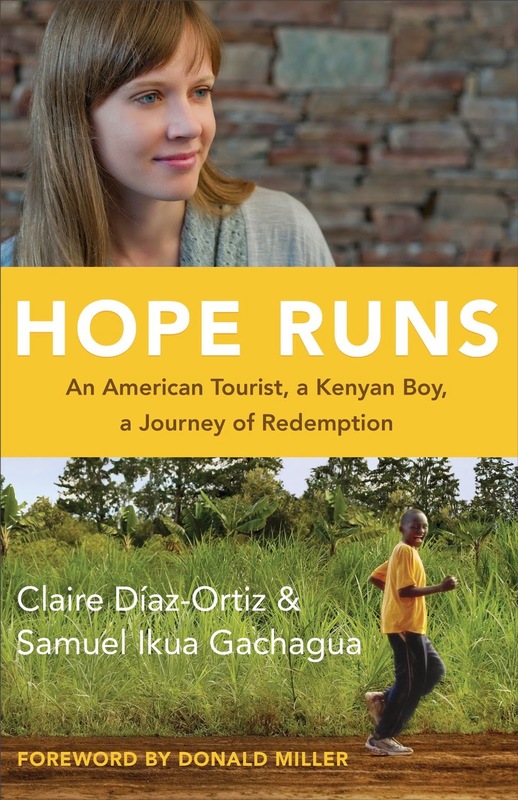 A few weeks ago, I received a pre-release copy of "Hope Runs" by Claire Diaz-Ortiz and Samuel Ikua Gachagua, from Revell Books. I was not given anything in exchange for this book copy, and the words written below are my own; I receive nothing for sharing my opinion of the book. The book "Hope Runs" was CRAZY GOOD! It's not too often I read a book that is hard for me to put down, but this was one of them. From the moment it came in the mail, and I cracked open the cover, I was taken in. I found myself wanting to have a day free to just read it straight through, but it never came, so I had to steal moments wherever I could to find out what happened next. I was more interested in the lives of the 2 authors than I was about the organization, Hope Runs (of which I knew NOTHING about). All in all, it would be difficult to NOT learn about the organization, and the insight is good for anyone involved in non-profit organizations and giving. I LOVED the format of it, as the chapters flip back and forth between the 2 author's tales and takes on life. It was so necessary to hear from each of them what their background was. To learn where they came from said so much about where they were going. Although I would have loved to have heard more about where God was fitting in all of this, I was grateful for the glimpses they shared. It's not going to be "that book" to bring you closer to God, but more to encourage you to step out of the daily faith walk and put action to your beliefs. The things accomplished through each of them are amazing. To hear of life in so many places, is delightful. Seeing them willing to be taken out of the norm and put in new circumstances challenged me in my own life. It really was inspiring. I'm already looking forward to seeing where their lives are in 3 years, 5 years, 20 years down the road, and hope that they continue to share the journey with us! I'm certainly going to check out their Twitter accounts (though I may pass on the series of tweets while Claire Diaz-Ortiz was in labor and tweeting live!). I'm curious where this story will end... knowing it's really just begun. Lord, I pray that You will continue to intercede and advance Your Cause through the lives of those involved in this story. Nurture the lives of Claire Diaz-Ortiz and her family, and Samuel Ikua Gachagua and his family and EXTENDED family. I pray that they will continue to draw close to You, and see Your hand leading and guiding them, as they chase after You and learn more of You. Let this book increase the good work that Hope Runs does, and may Your Spirit move through it. The book, "Hope Runs" is released on April 15, 2014 - on Kindle and wherever books are sold.